13 x 19" 8-color dye archival inks, 1" white border. Museum quality acid-free cotton fiber paper at 300 gsm paper weight. Hand signed & numbered. 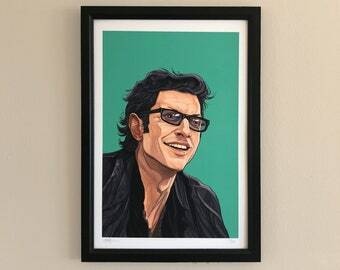 NOTE: Frame not included. How many Geek references can you spot?! 88 in all! When I was first asked to create a print for the Generation Geek gallery show in Bourges, France for Geek-Art, I was surprisingly stumped. Not because I couldn't think of what to do, but because there were too many options. The theme was Geek History from the past to the present, a pretty open topic, so... where to start?! My initial thought was to involve Godzilla. Then I decided to draw just a few more of my favorite characters from science fiction and fantasy from the last century; from books, comic books, cartoons, movies, video games etc. - the ones that inspired and wowed me from childhood to today. You know, just a few. Then it got personal. 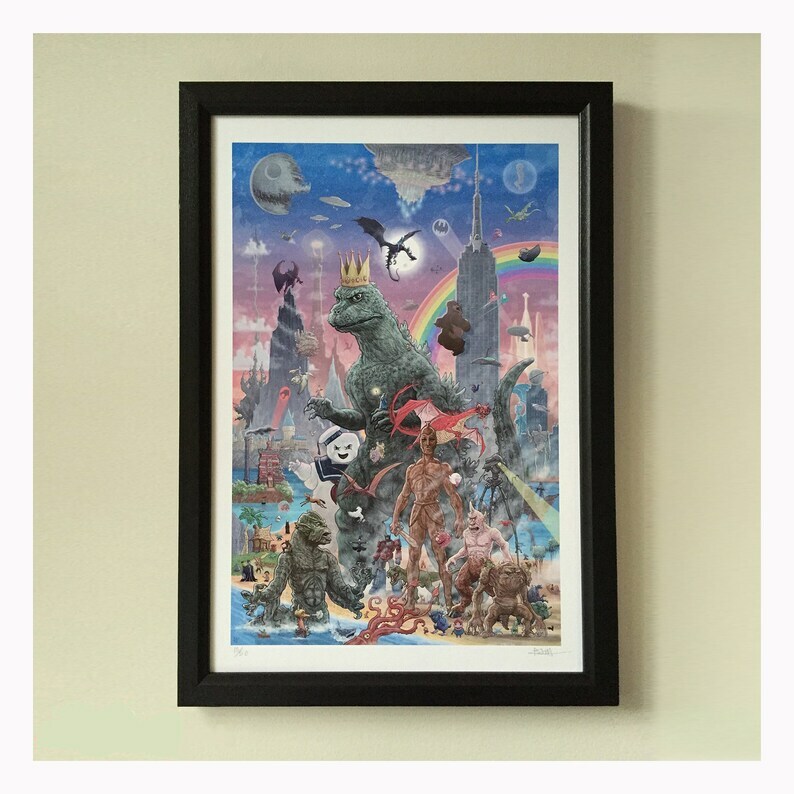 What happened next was this, a print depicting my own geek history, my ODE to GEEK. 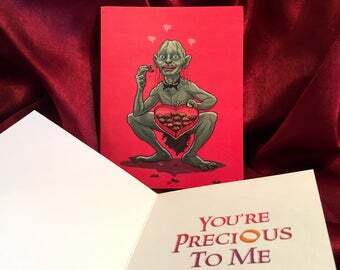 YODA CUPID Star Wars Fridge MAGNET! PENNYWISE 2017 It Christmas ORNAMENT! THE DUDE 8.5x11" Limited Edition Big Lebowski PRINT! ANY 5 STICKERS Discount COMBO! This is the fourth item I’ve ordered and it might be my favorite Etsy shop. Always happy with the item and always surprised at the shipping speed. I adore you! This amazing print came well packaged in tube with heads-up on shipment from CMcQ. My 37 y.o. son/sci-fi fan loved it. My new go-to shop. ThkU CMcQ for creating this original, signed art. I accept PayPal as my primary method of payment or credit cards through Etsy's processing. Orders paid through Etsy will show on your credit card bill as ETSY Brooklyn, NY. • I ship USPS from Brooklyn, NYC with stamp postage to offer you the most economical shipping method possible. Hence, there's no tracking. Domestic orders within the USA will generally take between 4 to 6 business days once shipped for travel. • International orders (outside the USA) take about 6-15 business days for delivery. Orders to Australia, New Zealand and various countries can take a bit longer than that, a few weeks or more, so please take note & be patient. * Though rain nor snow won't stop the USPS from delivering your order, it may indeed delay delivery, especially during the rough winter months. Though year round, there can delays for various reasons. USPS failures are not my fault or a reflection on my level of dedication to my customers. I strive to ship asap, for this reason I will use the addresses provided to us on the order, unless notified quickly of a change by the customer. * That said, I am understanding, so get in touch and we'll work it out. Yes, I wholesale! Drop me a line for more info. 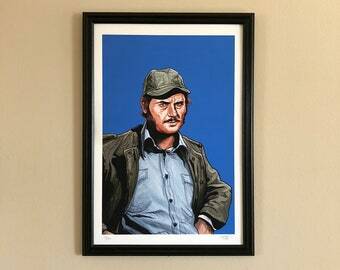 QUINT 13x19" Limited Edition JAWS PRINT!